The rear port lights of the new Linksys Wireless-N Router indicate both the activity and network speed of the modem and computers connected directly to the router. NOTE: Image may vary depending on the model number of your router. NOTE: The front panel (brand's logo) LED on the E4200 router’s front panel cannot be switched OFF. NOTE: For the list of devices compatible with Linksys Connect, click here. Launch Linksys Connect on your computer. NOTE: To launch Linksys Connect using Windows, go to Start > All Programs > Linksys Connect. To launch Linksys Connect on a Mac OS, navigate to the Applications folder in Go, and then start Linksys Connect. If you need more help, click here. 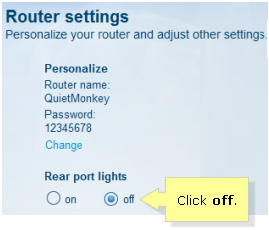 On the Linksys Connect window, click Router Settings. Under the Rear port lights section, select off. Access the router's web-based setup page. To do this, open a web browser such as Internet Explorer, Google Chrome or Safari. On the Address bar, enter your router’s IP address then press [Enter]. When the login prompt appears, enter your router’s User name and Password. NOTE: The default IP Address of Linksys routers is “192.168.1.1”. 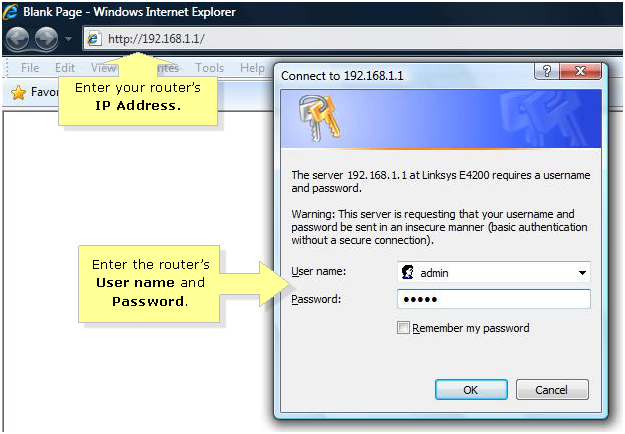 To view instructions on how to check the IP address of your router, click here. NOTE: The default User name and Password is “admin” but, if you have successfully installed Linksys Connect on your computer, you may have to open the software to retrieve them. QUICK TIP: To retrieve your router User name and Password through Linksys Connect, launch the software and go to Router Settings > Advanced Settings. For detailed instructions, click here. On the main setup page, click on the Status tab, then click the Ports sub-tab. NOTE: On this page, you will be able to view the wired connections of your router. On the section that says Rear Port Lights, select Off to deactivate them. Click Save Settings to apply the changes. Then, click Continue on the next screen. The changes you made to the rear port lights should immediately take effect.